Foreign Ministry issues a statement asking for cooperation while Ministry of Defense denies any link between military drills and Ukraine. A week after an agreement was signed bringing an end to the standoff between protestors at the government of Viktor Yanukovich, Russia is calling for all parties to honor the agreement. The Russian Foreign Ministry issued a statement pointing out several ways the agreement is not being respected. “Militants have failed to surrender their weapons. They have not vacated government buildings, and they are announcing their plans to 'restore order’ all across Ukraine,” the statement reads in part. The ministry has also expressed concern about the new government currently working in Kiev, saying that instead of creating a national unity government, the new government includes representatives of extremist groups. Russia has also warned against “further polarization of society as a result of actions by radicals." In particular, Russia is concerned about the repeal of a 2012 law that allowed regions to adopt more than one language for official use. However, Russian politicians do not think that a break-up of Ukraine would be in Moscow's interests. Mikhail Margelov, head of the foreign affairs committee of the Federation Council, Russia’s upper house of parliament said that he has not heard calls for separation, even from pro-Russia Ukrainians. “Last Thursday I was in Kharkiv, attending a congress of members of local councils representing Ukraine's southeastern provinces and Crimea,” Margelov said. Margelov’s calls for caution are in contrast to the comments by some experts. Konstantin Zatulin, head of the Institute of the CIS Countries in Moscow, said in an interview with the Moskovskiy Komsomolets newspaper that Moscow "will not allow reprisals" against ethnic Russians in Crimea, although he added that members of the Crimean parliament and the Sevastopol city council should enter into talks with the new Ukrainian government to bring the situation back to normalcy. Meanwhile, the Russian Ministry of Defense has denied any link between the snap drills now under way in Russia and the developments in Ukraine. According to Defense Minister Sergei Shoigu, the scale of the drills is very large, so some individual elements may take place in the direct vicinity of Russian borders, including the border with Ukraine. Shoigu categorically denied, however, that the drills were meant to send some kind of signal to Russia’s neighbors. "The fantasy of our experts, including military experts, knows no bounds," Shoigu said. On Thursday, the Moskovsky Komsomolets newspaper cited a source in the Russian Ministry of Defense as denying reports about any movements by the Russian marines' heavy weapons in Crimea. 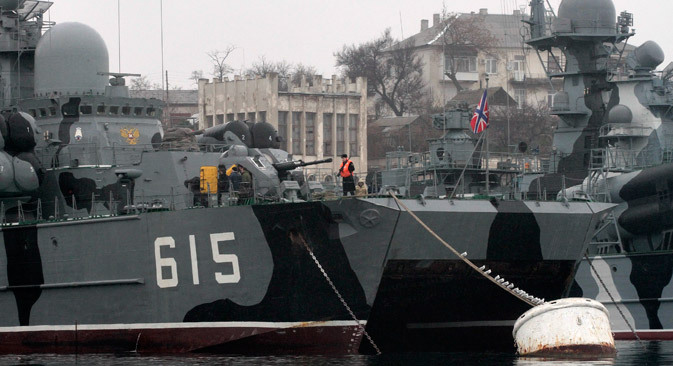 "The Black Sea Fleet is not involved in the snap drills now under way. So far, there has not been a single photo showing this alleged heavy armor on the move. This is probably just a piece of deliberate misinformation," the paper reported. The Foreign Ministry also expressed a desire to work with foreign partners to reduce the tensions in Ukraine, within reason. The Foreign Ministry statement added that while Western countries have also called for cooperation with Russia, the request sounds hollow given recent statements from the NATO secretary-general to the effect that NATO membership must remain among the main objectives of the government in Kiev. "We strongly advise that everyone desist from provocative statements and respect Ukraine's non-aligned status, which is confirmed in the Ukrainian bill on the founding principles of domestic and foreign policy," read the Foreign Ministry’s statement. Based on reporting from Moskovsky Komsomolets and Vzglyad.